The arms are of the Swedish noble family Nordencrantz. The plate belongs to a service ordered by Anders Bachmansson Nordencrantz (1697-1772), ennobled in 1743, and dates to the Qing dynasty, Qianlong period (1736-95) c. 1750. Anders Bachmansson Nordencrantz was a Swedish Trade Councilor who according to a contemporary source "had acquired deep insights into commercial matters and had a considerably amount of property, besides owning several factories". 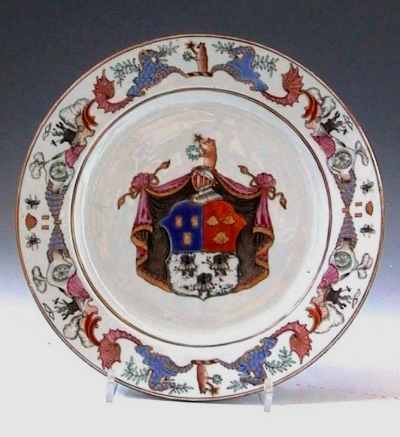 The rim is decorated with an unusual rococo border. It is composed of details - bees, the bear, the star, the garland and sea shells from his crest and coat of arms - as well as water wheels, rods, tools, anvils, Mecurii staffs and furnaces, referring to his industrial interests. The border is well worth a close study. It is a fully European design most cleverly done, with several miniature pictures combined to make out a running picture, which creates such a Chinese effect that at first sight it seems like a pure dragon ornamentation. On this plate metallic silver appears to have been used as a background to the bees at the bottom part of the shield which seems to have proved to be a less then perfect technical solution. Literature: Illustrated and discussed in Bo Gyllensvärd, Porslinet från Kina, p. 151, figure 306. Jan Wirgin, Från Kina till Europa, p 136, ill. 139. Stig Roth, Chinese Porcelain, p. 31, ill. p 13.